Tests in real conditions during clinical trials at the University Hospital in Rennes and the CMRRF in Kerpape on a sample of 36 patients, lasted 4 weeks. ROBO-K has helped improving significantly their walking performance.For example, on the 10-meter walk test, the patients take 38 seconds at the end of the therapy compared to 54 seconds before. It is noteworthy that all of the walking indicators assessed during the study have been improved. 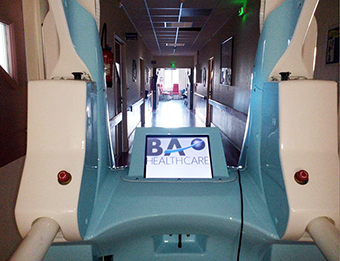 BA Healthcare, which designed the two demonstrators of the Robo-K project, has been much involved, for several years, in research projects and collaborative innovation, placing at the heart of its approach the human and the understanding of the environment in which robots operate. Robo-k is the perfect illustration of a successful combination of skills and know-how between mobile robotics and humanities. ROBO-K II is finished, long life to ROBO-K II! Launched in September 2012, the ROBO-K collaborative project to design a mobile walking rehabilitation robot was completed on January 12th. A closing meeting was held on January 12th at the Physical Medicine and Rehabilitation Department of the Rennes University Hospital withall the partners, funders and competitiveness clusters involved in the project. Robo-K is the first autonomous ambulatory device for walking rehabilitation, integrating many technical innovations to offer the patient an ecological rehabilitation, closest as it could be to the natural walk, without restrictions or technical assistance. A demonstration of the robot allowed the partners to understand and visualize how the device operates in a therapeutic environment. This meeting was also, and above all, an opportunity to draw up a balance sheet and give the results of an exciting project, both from a human and technical point of view. During three and a half years, ROBO-K has federated 6 partners around the same objective: to learn how to make patients walk again using advanced techniques stemmed from robotics. ROBO-K project was also innovative in its approach and the importance given to the questions of use and acceptability. These notions were the guiding principles of the project, organized around the idea that a technical object, in order to achieve its therapeutic purpose, has to be part of a process involving different types of people (physicians, physiotherapists, occupational therapists, patients) within the organization of the care of a particular institution. As part of the pilot study aimed at assessing the social acceptability of the use of the device, two demonstrators joined the University Hospital in Rennes and the CMRRF in Kerpape in September 2015. The results of the study are very encouraging both in terms of the device’s acceptability and its clinical effectiveness. On a sample of 36 patients, the majority of indicators measuring the walking performance improved significantly. For example, the FAC (Functional Ambulation Classifications), a functional walking test that measures ambulation capacity, increases by 40% on average. This meeting was also the opportunity to announce the new ROBO-K II project launching. 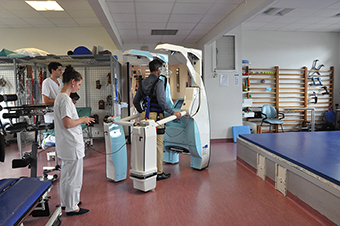 A 18-month collaborative project funded by the Brittany region, bringing together BA HEALTHCARE and M2S (Biomechanics Laboratory of Rennes 2 University), ROBO-K II will allow the addition of the biofeedback functionality that could not have been developed during the first project and develop a new mobile device closer to market expectations, including a future industrialization perspective. The ROBO-K II project is to begin in February. 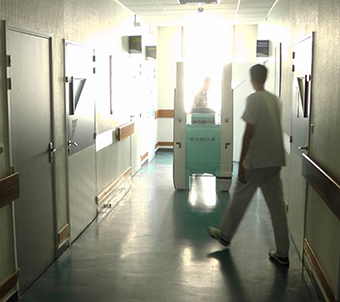 At the same time, as part of a FHU (Federative University Hospital research project), the Rennes University Hospital will continue to use the ROBO-K demonstrator to conduct an efficacy study among 74 additional patients and consolidate those first very encouraging results. BA Systèmes and BA Healthcare speak about the latest news of the Group’s medical activities. 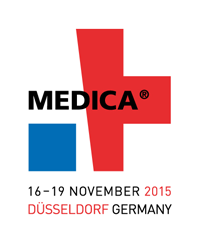 Medica is the international meeting for medical technologies and products. BA Healthcare will be present from November 16 to 19 at Dusseldorf Exhibition Center. We will introduce for the first time our last product: FORWARD, mobile device for gait rehabilitation. Come and meet us in Hall 5, booth 5M30G. The second demonstrator has arrived in Rennes University Hospital, in the functional reeducation department of Pr I. Bonan. Here again, the machine made a strong impression to the people who attended its arrival in the department, especially when climbing into the elevator. We are now used to the mapping of the environment and the first tests in real situation. The robot did well, sneaking between the chairs in the corridors. Its holonomic trajectories allow it to pass by the tiniest spaces with much ease and make everybody forgot its large size. We wait with much enthusiasm for the first feedbacks of the patients and practitioners. 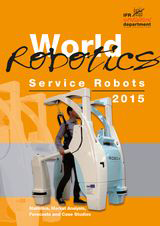 RObO-K is featured on the cover of the “World Robotics Service Robots 2015″ published by the IFR, International Federation of Robotics. 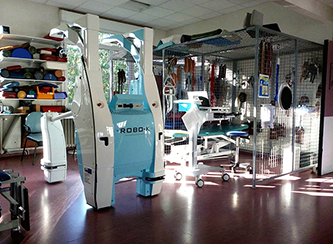 Clinical partner of the project, Kerpape center is going to test Robo-K in real situation with patients to check how the robot interacts with the therapeutic process.